We are near from the city and 20 minutes from the airport. Our 15 rooms have toilet, shower, direct telephoe, ADSL, Safe, LCD TV and minibar. The atmosphere in our 2 restaurants is to feel at home… Enjoy it with a lunch or diner.Enjoy your immediate or your business meeting in our Leuen or Privat room with space from 4 up to 40 people. We have enough parking facility. 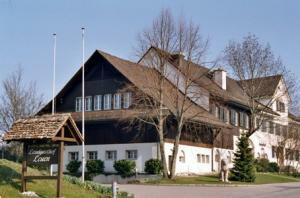 The Landgasthof Leuen and its staff have gained a lot of experience with arranging meetings, conferences, trainings and all sorts of events. Offering conference facilities including three meeting rooms the hotel has been used as a conference hotel in Uitikon on a regular basis. Please also have a look at the other conference hotels in Uitikon which we are proud to present to you.